I’ve been playing StarCraft 2 for about three years. I’ve also been watching StarCraft 2 games played by others for the same amount of time. All of the games I’ve watched were streamed online, meaning I went to a Web site like Major League Gaming or Twitch.tv and observed people all over the world playing against each other. I’ve also enjoyed learning from Sean “Day9” Plott, who is a former professional StarCraft gamer and current commentator and analyst. Again, all of these episodes streamed over the Web. These days the majority of my games are 2v2 or 3v3 games with my friends. The team format doesn’t get a lot of attention, and I wondered if my friends would get a kick out of watching me play. On a personal level, I wanted to start streaming because Sedagive? is too short to see my monitors at my standing desk. She used to sit by my side in Virginia and watch me play, and we still watch tons of online games together. I figured it was time to figure out how to share my gaming experience with my family and friends. About two weeks ago I started streaming my own games on Twitch.tv. You can watch me play on my Twitch channel, www.twitch.tv/drfaulken and view our past games here. I play 1v1 games every now and then, but the majority of my playtime is in team games. I’m hooked up to a microphone and call my partners over Skype, so there’s a lot of interaction while the game goes on. Most pro-gamers have a Web cam running on themselves while they play, but I thought it would be more interesting to see the keys that I press during games. I run a virtual keyboard that shows up on the stream when I’m playing. So far streaming has been a lot of fun, especially for my friends who are completely new to StarCraft. It’s fun explaining the game to them and answering their questions. The in-game chatter between myself and my partners is fun to listen to, especially when the action heats up. The easiest way to watch me stream is to create a Twitch.tv account and follow the channel. The next best way is to like our group on Facebook, and then if you’re the kind of person who likes to try your luck you can just tune in randomly. 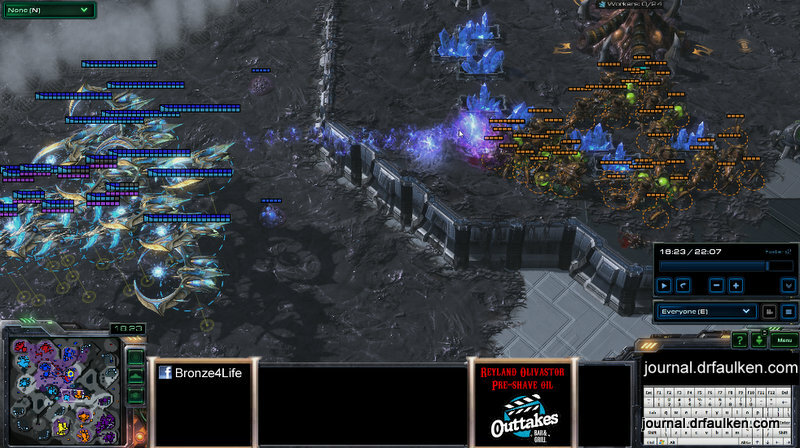 3 Comments on "Bronze4Life StarCraft 2 Stream"
I am watching the recorded ones now. Warn Roger! When did you stop doing Protoss?